White Paper Published By: IntelliCentrics, Inc. The credentialing and privileging process is complex, time-consuming, and detail intensive. Many of the problems with today’s credentialing process stem from the fact that neither the people nor the systems are solely focused on or optimized for credentialing. This inefficient process naturally leads to errors and increased costs. 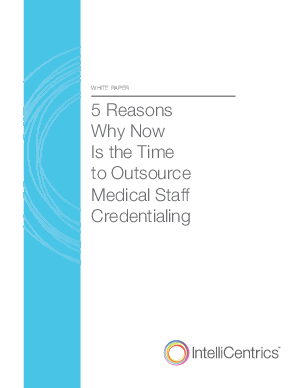 Discover 5 reasons why now is the time to outsource medical staff credentialing.